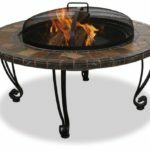 The UniFlame WAD820SP 34-Inch Slate & Marble Outdoor Firepit with Copper Accents is an absolutely beautiful piece of outdoor furniture. With its slate and marble surround, it really does bring a touch of class to your patio, lawn or any other garden environment. 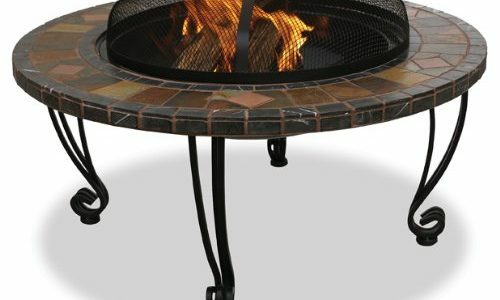 Loading and tending to the UniFlame Fire Pit couldn’t be easier, its large 22-inch diameter fire bowl makes it a cinch. The fire bowl is also a high-quality black porcelain which offers added durability. This is a solid built unit which includes a heavy steel grate with easy-lifting spark arrestor, set securely on a wrought iron stand. 34 in. diameter fire bowl heats up to 150 sq. 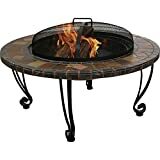 ft.
We found over forty reviews for the UniFlame WAD820SP 34-Inch Slate & Marble Firepit with Copper Accents during our investigations and the overwhelming majority of them were positively glowing. UniFlame really do seem to have hit the nail on the head in terms of good design and a competitive price this with this particular fire pit. 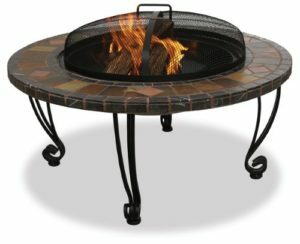 Many of the reviewers complimented its attractive design saying it is one of the more classy looking fire pits available at the moment. The designers attention to detail really has not gone unnoticed amongst the consumers, especially the marble, slate edge and copper accent decorations. A couple of reviewers say the spark-guard may be a little coarse, meaning the odd ember may escape and float away, but this view was clearly in a minority. A lot of the customer feedback we studied mentioned how quick and easy it was to assemble and use straight from the box. You can have your fire pit up and running in no time at all. The build quality is also mentioned frequently throughout the reviews. The fact that the fire blow has a porcelain finish means it has added protection and durability from the elements, giving greater value for money. One review has had their UniFlame fire pit for over two years, he says it’s still going strong and looks wonderful, even after two particularly harsh winters. High praise indeed. Judging by our investigations the UniFlame WAD820SP 34-Inch Slate & Marble Firepit with Copper Accents clearly appears to be a massive hit with the punters. We have no problem recommending it as a potentially excellent choice in a fire pit.